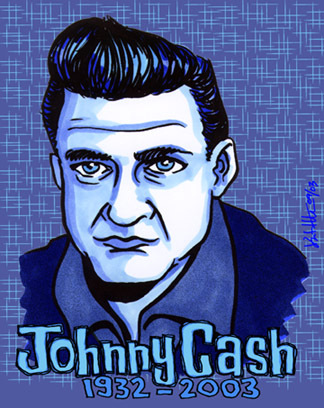 After a depressing September 11th, I awoke still sad on September 12th only to fall further into the dumps upon learning of the death of Johnny Cash. Oh, and John Ritter. But while Ritter’s death was far more of surprise, it didn’t carry the weight of the passing of a true legend in American music. Or so I thought. For, through the wonders of television, I have been corrected. Thanks to entertainment-themed TV shows, I now know that John Ritter’s impact on our culture was much greater than Johnny Cash’s. On most shows I saw that day, the amount of time dedicated to the Man Who Was Jack Tripper far outweighed that given to the Man in Black. To add to the bizarre unbalance, John Ritter has now entered that pantheon of people in the public eye (like Sonny Bono, Aaliyah and Richard Nixon) whose legacy has improved exponentially upon death. Suddenly, Ritter has become an irreplaceable genius rather than a serviceable practitioner of his art. Now, J.R. “Johnny” Cash, on the other hand, is an indisputable American classic of the grandest scale. Influencing every generation since the fifties, his career was a remarkable display of passion, originality, perseverance and reinvention. He is to country music what Sinatra is to pop or Louis Armstrong is to Jazz: the quintessential Artist. The sad fact is, while it may be a ridiculously potent artform, music does not have the mass impact that television does. A smash album sells a half a million copies while a network TV show that is watched by less than ten million people is deemed a failure and is cancelled. Okay, Okay, I know what you’re thinking: “What do you expect from TV, especially shows like ENTERTAINMENT TONIGHT?” And you’re right, what I EXPECT is just what I got: Pretty “anchors” feigning emotion and delivering piffle. But I’m enough of a pop culture dork to not let go of the tiny hope that somewhere within these organizations there’s SOMEBODY who wants to fight the good fight and give due to those who deserve it. Maybe even teach the people something. Call me crazy. In the meantime, I can mourn Johnny Cash in my own way. I’ve been playing the Sun and the Columbia records, but his late American Recordings albums are his most poignant epitaph. Nothing brings the tears more than the final song on his final album, AMERICAN IV: THE MAN COMES AROUND . It’s a version of “We’ll Meet Again” that sounded to me like Farewell the first time I heard it (part of me wonders if producer Rick Rubin designed it that way). Backed by “the Whole Cash Gang”, the ragged, soulful voice of a man nearing the end of his journey wishes us well as he plans to go to a better place, leaving this place just slightly poorer for his absence, but much better for the legacy of his presence.